Tower Room Plus Two Buffets! With your upgraded tower room stay, enjoy two buffets, free self-parking, Splash Zone, and discounts to The Adventuredome, The Midway and more! Promo rate is only valid when booked at CircusCircus.com. Must book by 12/28/2019. Offer is valid for stays through 12/28/2019. Two (2) night min stay required. Phone reservations are subject to higher rate. Daily resort fee, plus tax, will be added. Rates are based on single/double occupancy and subject to availability. Splash Zone access subject to availability. Max of 4 guests per room. Additional guest charges will apply. First night's deposit is required and fully refundable if cancellation is received by Room Reservations at least 72-hours prior to arrival. Valid credit card must be shown upon hotel check-in. Must be at least 21 years of age to check in. Offer is non-transferable, not available for existing or consecutive reservations, may not be combined with any other offer and not available to meeting or convention attendees. Blackout dates may apply. Max of two (2) buffets, per stay. Unused Buffet Voucher has no cash value. In the event of an interruption in buffet service, a reasonable dining substitution will be offered. Gratuity excluded. Nightly rates are 10% commissionable to valid IATA, ARC, CLIA, and TRUE/OSSN travel agency. Specific room types and locations cannot be guaranteed. Management reserves the right to cancel or alter this promotion without notice. Other restrictions may apply. MGM Resorts International offers GameSense information to its patrons to encourage responsible gaming at mgmresorts.com/gamesense (in MA at gamesensema.com). If you or someone you know has a gambling problem or concerns with gambling responsibly, please call the 24-hour Problem Gambler’s Helpline at 1.800.522.4700, or call 1.800.GAMBLER (in New Jersey and Maryland), 1.800.426.1234 (in Massachusetts) or 1.800.270.7117 (in Michigan). Or visit mdgamblinghelp.org (in MD) or masscompulsivegambling.org (in MA) for help. Please play responsibly. If you bet more than you can afford to lose, you’ve got a problem. 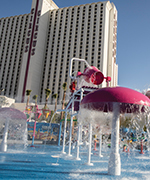 ©2019 MGM Resorts International®. All rights reserved.